The view of the Patacancha valley on the way to the ruins. While we were in the small ancient Inka town of Ollantaytambo, Peru, we had about half the day to spare on our last day there before we caught our train to Machu Picchu. The people at the hostal we were staying at (Hostal Iskay) told us about a hike we could do to the Pumamarca ruins. They said it should take us about 5 hours round-trip. I was totally up to it (and my mom was kind of unsure), but we went anyways. If anybody reading this is planning on doing the same hike, my story might be useful (I couldn't find anything on the internet when I looked before leaving to Peru). A Peruvian woman leads her sheep around. The guy working at the front desk (his name was Jose) was kind enough to draw us a really rough map on how to get there. Basically, the map told us to take the dirt road out of town that followed the Patacancha River, north. There would be three bridges that we would need to cross along this dirt road. Eventually, after the third bridge, the road would take us to a very small town called Pallata. 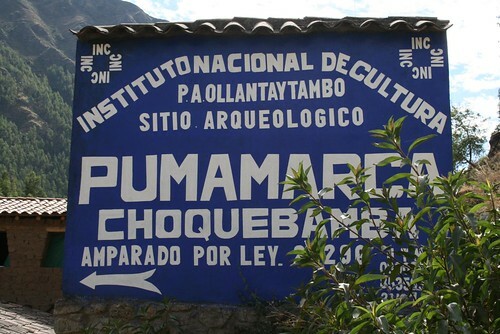 It would be in this town that we would see a sign for the Pumamarca ruins. Then for the way back, he recommended we take a hiking trail which would take us over "the 700 steps." It seemed very straight forward while he was drawing it for us on the back of our receipt. For some time estimates, he told us no longer than 2 hours to Pallata, 1/2 hour up to the ruins from Pallata, and then 1.5 hours on the trail from the ruins back to Ollantaytambo. It sounded perfect to us. The sign pointing hikers to the ruins was bigger than I expected! The actual hike we took was more of an adventure than it looked on the hand drawn map! We followed the road north out of town, at a brisk walking pace, starting our hike at 7:40am (I recorded the time that we reached major milestones on the map Jose drew). Soon we walked over the first bridge at only 7:45am. Right after this bridge, the road split into two (but then rejoins again later). You can choose which fork to walk down, and we chose the right fork which follows the river, as this was a pedestrian-only path, and the cars had to take the left fork. I considered the hike to really start here, because the scenery started to get more beautiful as we got farther from the town of Ollantaytambo. Near the river, it was a lush oasis of trees and other plants. We saw school children running past us, late for school I guess, and they all smiled and waved to us. The mountains got taller and taller. At 8:07am we reached the place where the two forks rejoin, and by 8:30am we reached the second bridge. 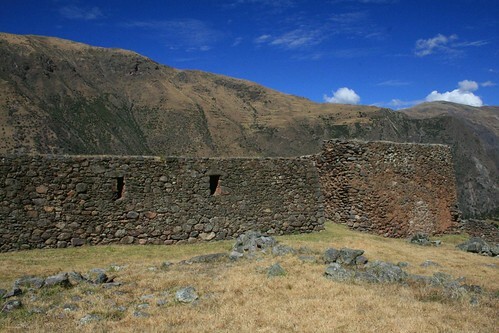 The Pumamarca ruins and a beautiful blue sky. We paused here at the second bridge, and saw a man riding a really furry horse pass us by. As he passed us, he asked where we were going (I guess not many gringos walk this way), "Pumamarca?" And we nodded. He didn't show any sign of concern as he rode away, so we assumed we were on the right track. According to our map, we would soon be able to see the 700 steps that Jose drew. From far away they looked like lines on the side of the mountain. When we got closer, you could start to see the terracing, but it was badly overgrown. There were sooooo many terraces! I didn't count, but I don't doubt that there were actually 700! Although it was beautiful mountain scenery, this part of the hike seemed to drag a lot. I don't know why. At 9:09am we reached the third bridge. Jose instructed us to keep going after the third bridge, even though all the cars that drive up to the ruins turn here at the third bridge. So we kept walking towards Pallata. We got there at 9:43am, almost exactly 2 hours after we set off from Ollantaytambo. At the town, we saw a big blue sign marking where we should turn off of the road to go to the ruins. It pointed us down a foot path that took us past a few houses to a creek. When we got to the creek, we were confronted with another fork in the trail which Jose didn't tell us about! There were two bridges over the creek, which lead to two different trails. 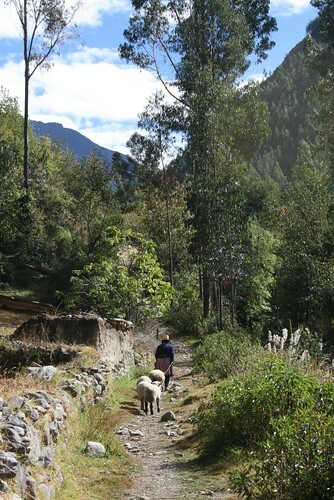 An old lady leading her sheep around took the left bridge, so we asked her if she was going towards Pumamarca. She just swung her arms up towards the top of the mountain, and kept walking, which was her version of a signalling to us, I guess, of where Pumamarca was. But by this point, we already knew where it was since it is possible to see from the road we were walking on. We just decided to follow her over the left bridge. There was a trail going very steep up the mountain towards Pumamarca which disappeared and reappeared. Then it totally disappeared when it junctioned with dirt road half way up to the ruins. 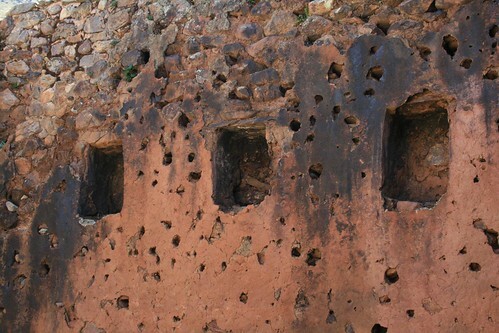 Detail of the ruined walls at Pumamarca. We knew where the ruins were, so we just kept taking every opportunity to go up, be it footpath or road. Eventually we got to the ruins, but I think we must of taken a wrong turn somewhere, but maybe not, because it seemed very indirect! It took us over an hour to reach the ruins from Pollata! My mom was dragging behind me, and after a while I got really far ahead of her. When I reached the entrance of the ruins (a small wooden gate) the place was totally deserted. I was the only one there! So I opened the wooden gate and started walking around the ruins. They were so high in the mountains! Everywhere you looked, it felt like you were on top of the world! As I walked in and out of the rooms, I tried to imagine what they were used for. I had no information about these ruins, other than they were really old (8th century AD supposedly, and inhabited continuously until the Spanish conquest). I started to walk back towards the entrance to see if my mom made it yet or not. As I did, a man popped out behind a wall holding a machete. No joke! It was a big machete! I got so scared for a second, but then he smiled and said hello. After the initial scare, I noticed he was wearing a INC uniform (like a national park ranger kind of). OMG, the machete was for cutting overgrown grass and weeds, not for murdering people while they were alone in the ruins! The color of the rock in the walls matches the surrounding mountains. I tried to talk to him, even though I don't speak Spanish at all, and tell him that my mom was coming behind me and that I just wanted to walk around and look and take pictures. He said okay, and that he would let my mom know I was here when she showed up. I am surprised that I was able to convey that message to him successfully, although it took me about 5 minutes of gesturing and stuff! These were the most beautiful ruins we had seen so far on the trip. And they were worth hiking to, in my opinion. I don't think my mom thought they were worth it, since she had a really hard time hiking up, at high elevation (over 2,000m). But she eventually made it, and after we saw the ruins, we asked the man with the machete how to get back to Ollantaytambo via the camino, or trail. He pointed us in a direction, but the trail was not very obvious. We figured we'd start walking that way and maybe we would see it as we got closer. As we started hiking back down from the ruins, a nice man named Henry that lived right next to the ruins asked us if we knew were we were going as we passed him by. 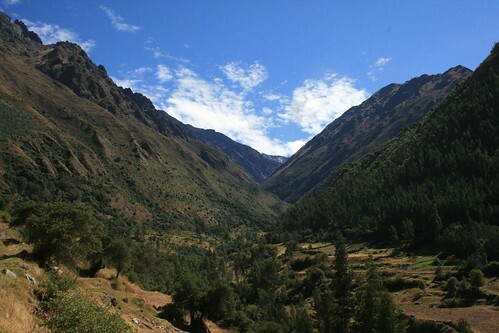 I said we were trying to find the trail back to Ollantaytambo, and he said he would show us how to get to it. I am so glad he showed us because it was not obvious at all!!!! He took us past bushes, through a farm with a few big cows, and in general along many meandering footpaths that just looked like animal paths, to be honest. 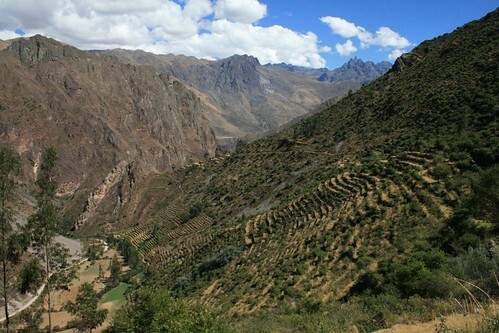 The 700 agricultural terraces on the trail back to Ollantaytambo. After about 20 minutes of that, the trail got more beaten in, and began to follow an ancient (i'm assuming ancient) aquaduct type thing. He left us at that point, since he felt the trail was obvious enough now that we wouldn't get lost. Thank you Henry!!!! The line on our map that Jose back at the hostal drew began to make me laugh now. At that point I also remembered that Jose said the trail would also take us past some waterfalls, and we would walk on top of the 700 steps. Sure enough, a few minutes after we left Henry, we saw a waterfall! And then we began walking along one of the 700 terraces. You could start to tell that the trail becoming a footpath over one of the highest terrace walls, because you could start to make out the stone walls beneath all of the overgrown vegetation. How awesome! This part of the journey also had the best views, since we were high up on the mountainside. We could see the Patacancha River below us, and the road we walked on earlier that morning. I felt like it might have been better to just get on this trail right out of Ollantaytambo when we were hiking to see the ruins, instead of taking the road next to the river. It certainly would've been more direct, but then again, we wouldn't of had the opportunity to see the 700 steps from below. At least this way we did a big loop, avoiding seeing the same thing twice. It took us about 2 hours to get back to Ollantaytambo on this trail. The place where this trail meets with the road coming north out of Ollantaytambo is behind a house, just past where the two forks in the road rejoin (the pedestrian-only fork and the car traffic fork, between the first and second bridge). We got back to Hostal Iskay around 2pm, giving us a little over an hour to spare before we had to head over to the train station. I read on the internet, before we left to Peru, that this hike was easy to moderate, but I think it's at least moderate, because of the elevation and the steepness near the ruins. 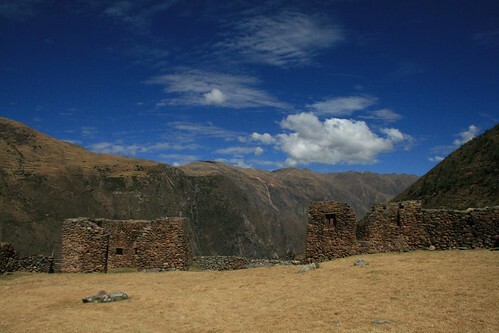 But it was well worth it and one of the most memorable of all the ruins we saw in Peru! Oh yeah, and unlike Machu Picchu and a lot of other ruins, it was free to enter! 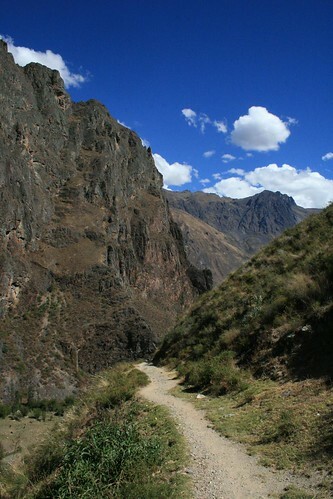 The trail back to Ollantaytambo. This weekend was the annual Russian River Rodeo located in Duncans Mills, CA, on the banks of the Russian River just inland of where it meets the ocean. We found out about it via a website I discovered that lists all of the rodeos going on all over the country. Its called rodeoz.com. It was an intensely rainy week before the rodeo, but the website said it was going on rain or shine, so we got our rain gear on and headed over there along Hwy 1. 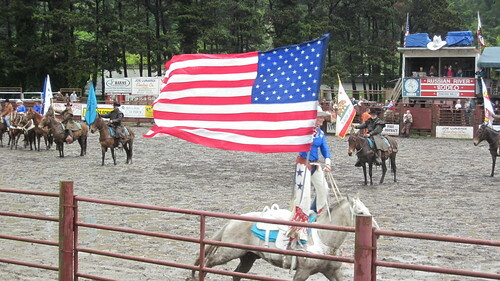 The American flag gets paraded around a few times by a cowgirl. We got there about half-hour early, and as it was still raining on and off, we headed over to have a drink at the tavern right across the street before the rodeo started. They had Pliny the Elder (brewed by the Russian River Brewing Co) on tap, so we ordered a pitcher and shared it with Nicole and Marcel, who came along for the rodeo. We had just enough time to enjoy our beer, when we saw all of the cowboys rounding themselves up on the muddy rodeo grounds. A video of a bull-rider at the rodeo. We hurried to get a spot in the bleachers, which were only half full because I guess a bunch of people were deterred by the rainy weather. I took a few videos of the bucking horse and bull riding events. We got to sit really close. It was a lot of fun! I hope I get to go the the Bridgeport Rodeo next month. I'm becoming somewhat of a rodeo-addict! A video of a bucking bronco rider at the rodeo. 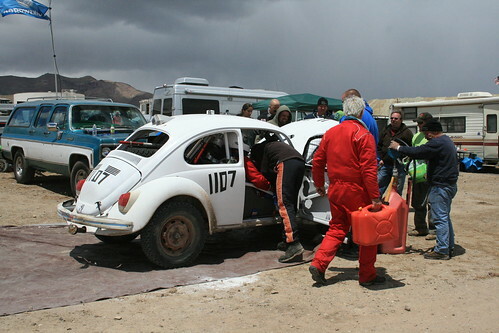 Romy joined a Class 11 team that does off-road racing. The car is called The Desert Dingo (check out www.desertdingo.com). 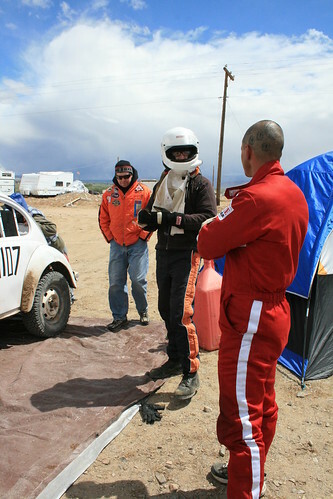 Here are some pictures from the Yerington, NV, VORRA race this past weekend. 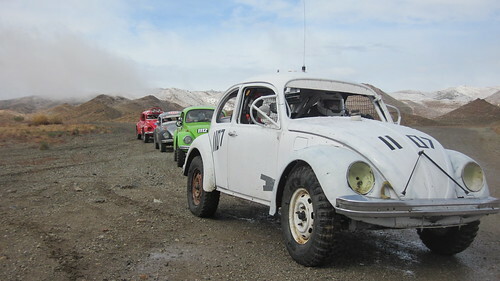 The Desert Dingo and other Class 11's line up at the starting line. 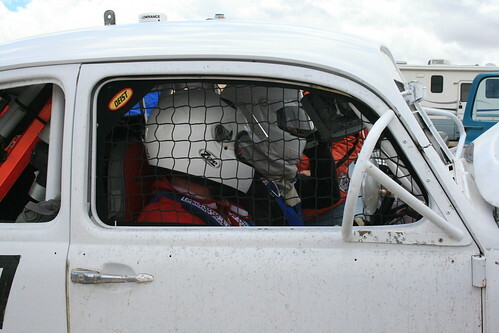 Romy getting ready to drive. 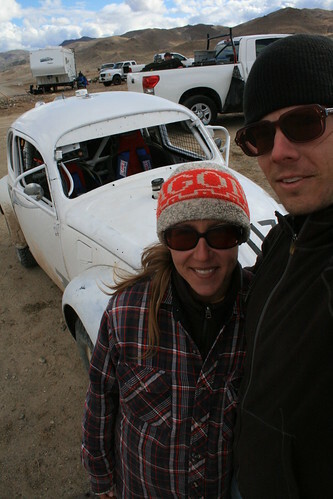 Romy and Jim, ready to drive off on the last lap! 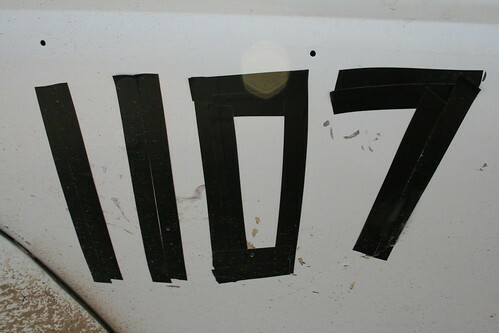 For now, electrical tape number. The Desert Dingo finished the race. The Desert Dingo is currently in first place with 100 total points in the Class 11. Next race: USA 500 July 15-17 near Reno-Sparks, NV.